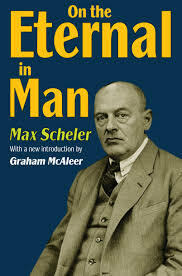 Max Scheler research papers on the famous German Phenomenologist who examined human behavior, actions and ethics. Several of Scheler's major works were wholly dedicated to the task of creating ethical systems in which human behavioral tendencies could be evaluated. However, despite worldwide recognition as an expert on the subject of ethics, Scheler’s own prodigious history of moral transgression was common knowledge among the members of the philosopher’s circle of colleagues and associates. When confronted with the irrefutable fact of his troubling proclivity towards hedonism and its apparent opposition to the staunch system of morals and ethics that he advanced in his scholarly work, Scheler is reported to have replied that “the sign that points to Boston doesn’t have to go there.” In Scheler’s worldview, his ability to formulate and justify complex systems dictating how people should act in order to best maintain ethicality was in no way impeded by his own apparent unwillingness to adhere to such strict standards of behavior. Although this anecdote may be apocryphal, it effectively serves to illustrate one of the most crucial points of divergence between the study of ethics in a broader philosophical sense and the distinct characteristics of a specifically Christian approach to ethics that follows the example set forth by Jesus Christ. In the realm of secular scholarship, ethicists often view behaviors and actions outside of a real-world context, speculating about potentialities and outcomes as if in an experimental test tube, as it were, completely separated from the consequences and influences of everyday life. Jesus Christ and Ethics - Jesus Christ and ethics research papers discuss the role of ethics in Jesus Christ's life, as laid out in the New Testament according to Christian Ethics. Heidegger - Heidegger research papers delve into the life and career of the German philosopher best known for his work Being and Time, Martin Heidegger. Philosophy and Ethics research papers discuss what people believe, such as religion, which offers rules of morality that they feel they are obligated to follow. Ethics in the Early Church research papers delve into an important framework of ethical behavior for Christians. Ethical Theories Research Papers - Jesus Christ and ethics research papers report that throughout the New Testament, ethical codes that are overly concerned with proscribing specific actions. Moral Issues in Society research papers examine an order placed on if certain institutions should practice the affirmative action. Religion and Morality research papers discuss the frameworks of morality in religions. Paper Masters writes custom research papers on Max Scheler, the famous German Phenomenologist who examined human behavior, actions and ethics.